Meet Setsuko: a quiet, depressed, socially isolated office worker, a tiny cog in the merciless machine that is Japan’s working culture. Her life seems to be on rails: endless cycles of work, smoking, sleeping, with the end result being utter rejection from society with retirement, or suicide, or both. Into her scripted life pops her young, energetic niece Mika, who persuades her to join an unusual English class led by John (Josh Hartnett). John’s strange and enticing teaching methods, which involve deeply immersive (and very funny) roleplay, soon take their toll on Setsuko. 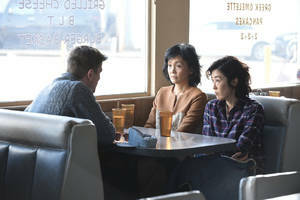 The lines between Setsuko and her American character developed for the English class, Lucy, begin to blur, and Setsuko begins to have feelings for John. When John disappears with Mika, Setsuko (or is it Lucy?) springs into action with her sister and heads to the States on a journey of discovery – both of what’s happened to Mika, and of herself. Oh Lucy! is Atsuko Hirayanagi’s debut feature film, based on her synonymous short film released in 2014.